Just got back (well, a week ago) from a fantastic vacation visiting my mom, dad and brother in Arizona with my bff Patti. What a GREAT vacation... equal parts relaxation and activity. 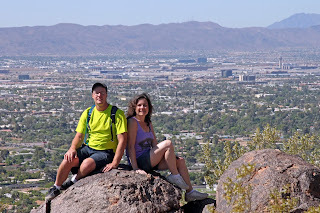 We hiked Camelback, drove along the Apache Trail (equally as beautiful as the Grand Canyon), explored Organ Pipe Cactus National Park, and got plenty of pool, sun, and hot tub time machine! 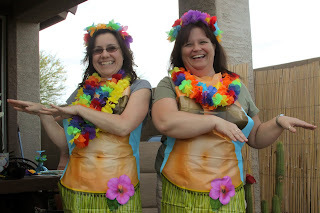 Celebrated Mother's and Father's day with my parents... and we were greeted by a Luau in the back yard! Felt like we were there for much more than a week. I came back feeling refreshed (and cold). But the sun is out today and I'm going to take advantage of it. Walk my two co-horts and then do some landscaping. Trying to catch up this morning with most of my business. On that note, new Idea Books are out along with fantastic new products. Check it out on my website! Can't wait to use some of them to scrap my previously mentioned vacation.